Wouldn't it be great if we could easily transform our homes to suit the weather, our mood or simply our changing practical needs? Perhaps one of the first—and still quite extraordinary—examples of transformable architecture is the Rietveld Schröderhuis, built in Utrecht in 1924. Custom-designed by Gerrit Rietveld for Mrs. Truus Schröder-Schräder and her three children after the death of her husband, this beautifully functional home follows De Stijl's principles of harmonious order and incorporates bold primary colors and geometric shapes while adapting to its inhabitants' needs and lifestyle. 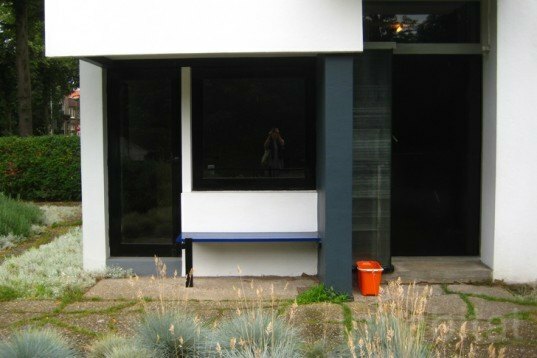 To make this classic adaptable home, Rietveld worked side by side with Mrs. Schroder trying to please her and her notions of living without walls and having a strong inside-outside connection. The only building ever designed to follow the basis of De Stijl movement—made famous by Piet Mondrian—the Rietveld Schröderhuis is visually very simple with its use of primary colors and geometric shapes. The outside-inside boundaries seem to blur, thanks to its many windows that open up completely to welcome nature indoors. The simple and straightforward house was made using long-lasting, affordable and standard materials like concrete, glass and wood, with floors made from rubber and even some small cork areas in the bedrooms, for standing when getting out of bed. A doorbell and a long horizontal window that only open a small area to receive the post straight to the working desk inside. A Zig Zag chair was used to sitting at the kitchen’s table while functional glazed food cabinets have been painted black only where they would get dirty. Upstairs, three bedrooms and a living room area around a central staircase and fireplace can be dynamically turned into a open big open space when opening wide up the sliding the walls. The house only has essential beautiful objects like the Red and Blue Chair, surprising pop-up tables like one next to a bed for only keeping water and a clock and beds that becomes sofas during the day, all for “an active attitude to life”. 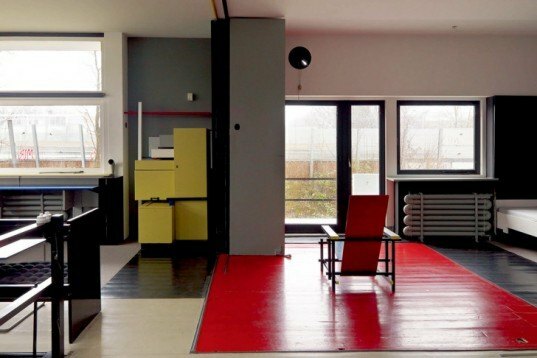 An exuberant experiment, a modern piece of architecture or just a home for a strong woman who knew exactly how she wanted to live, the Rietveld Schröderhuis is now a museum that can be visited with advanced reservation. For making this classic adaptable home, Rietveld worked side by side with Mrs. Schroder trying to please her crazy-at-the-time ideas of living without walls and having a strong inside-outside connection. 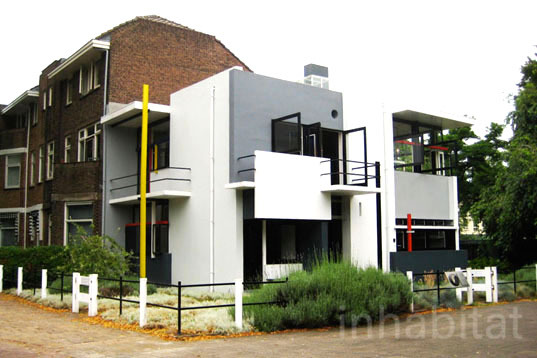 The only building ever made following the basis of De Stijl movement, this home is visually simple and uses only primary colors (in combination with white, grey and black), geometric shapes and vertical and horizontal directions. The outside-inside boundaries seem to blur, thanks to its many windows that open up completely, at right angles welcoming nature indoors. Simple and straightforward house was made using long-lasting, affordable and standard materials like concrete, glass and wood. A doorbell and a long horizontal window that only open a small area to receive the post straight to the working desk inside. A Zig Zag chair was used to sitting at the kitchen's table while functional glazed food cabinets have been painted black only where they would get dirty. Upstairs, three bedrooms and a living room area around a central staircase and fireplace can be dynamically turned into a open big open space when opening wide up the sliding the walls. Featuring only essential beautiful objects like the Red and Blue Chair and pop-up furniture, everything around the house is designed for "an active attitude to life". An exuberant experiment or just a home for a strong woman that knew exactly how she wanted to live, the Rietveld Schröderhuis is now open as a museum that can be visited with advanced reservation.